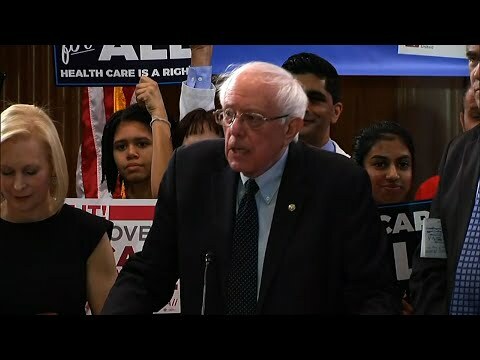 WASHINGTON (AP) — Sen. Bernie Sanders launched a revamped “Medicare for All” plan on Wednesday, highlighting a divide among Democrats over one of their bedrock 2020 campaign issues — the future of health care in America. House Speaker Nancy Pelosi has sounded skeptical about Sanders’ plan. Four of Sanders’ fellow senators and rivals for the Democratic nomination have signed onto the updated single-payer health care proposal. In addition to Gillibrand, they are Sens. Cory Booker of New Jersey, Kamala Harris of California and Elizabeth Warren of Massachusetts. “It is not a radical idea to say that in the United States, every American who goes to a doctor should be able to afford the prescription drug he or she needs,” Sanders said. As with previous versions of the plan, he did not include details on how to pay for it, offering instead some general options. Capitalizing on Sanders’ unveiling, Sen. John Barrasso, R-Wyo., fired off a letter to the Congressional Budget Office requesting a detailed cost estimate of Medicare for All bills in the House and Senate. “The American people deserve a complete and thorough vetting of this proposal,” Barrasso wrote to the nonpartisan number crunchers. Some Democrats seem to be trying to change the conversation inside the party to build consensus around “coverage for all” as distinct from the Sanders plan. They aim to reach that goal through various incremental steps, while preserving the traditional U.S. mix of public and private insurance. Democratic presidential candidates who don’t back the Sanders plan are focused on safeguarding popular provisions of the Obama-era ACA, such as the one that protects coverage of pre-existing conditions. The Democratic senators who support Sanders’ bill and are running for president also have signed on to various incremental plans, hedging their bets. The Trump administration, meanwhile, is arguing in court to strike down the Obama health law, which provides coverage for about 20 million people. Trump has said he’ll take up health care after next year’s election , essentially making it a central campaign issue.